If you enjoy trying out different green beauty brands and like receiving wellness products as well, Goodbeing is an international subscription box that's definitely worth checking out. Based in the USA, Goodbeing are one of those boxes that just gets it right when it comes to focusing on natural beauty and helping their subscribers to lead a healthier and more sustainable/eco-friendly lifestyle. 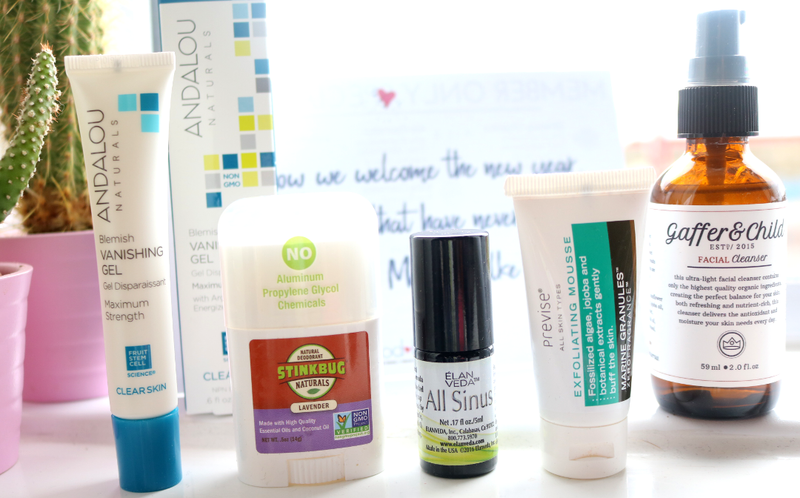 They offer a monthly beauty box alongside a lifestyle box, but if like me, you prefer getting the best out of both worlds, I'd recommend opting for the latter which is the one I'm going to share with you all today. When you sign up for Goodbeing, you fill out a pretty detailed questionnaire about your preferences and lifestyle, and this helps them to tailor products to your personal box every month. You also get to choose two of the products from a shortlist which is really great, so you get to pick and experience a surprise every month! 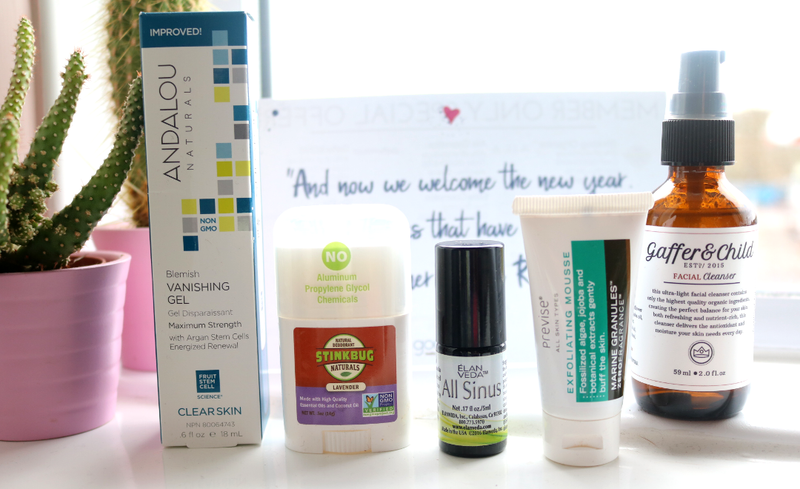 One of the products that I chose this month was the Blemish Vanishing Gel from Andalou Naturals as I've been wanting to try a new one for a while. This blemish busting gel contains a Fruit Stem Cell Complex with Argan Stem Cells, Willow Bark, Salicylic Acid and Camphor Extracts, which quickly gets to work, helping to reduce inflammation and speeding up skin recovery. I've only used it twice so far on some stubborn hormonal spots that have popped up on my chin, but I saw a noticeable difference straight away, especially with it reducing the redness and making them look a lot less angry overnight. Promising stuff! I'm always on the hunt for a new natural deodorant to test out and I've seen some really great reviews for the appealingly named Stinkbug Natural Deodorant, so I chose it as my second product. This deo stick uses certified organic ingredients and has a Coconut Oil and Beeswax base that's blended with Baking Soda and Cornstarch to absorb and eliminate odour-causing bacteria. It also has Lavender essential oil in it to give it a lovely scent, and I'm looking forward to putting it through its paces shortly. This product couldn't have arrived at a better time as I'm currently trying to fend off a cold that's been refusing to go away, and I've been suffering from the inevitable blocked sinuses for the past week. Luckily, this all natural, Ayurvedic blend with Eucalyptus, Camphor, Lemongrass and Rosemary oils has definitely been helping! You can apply it directly onto your nasal passage, add a few drops to a bowl of hot water for a steam inhalation, or simply use it with your humidifier. It gets to work quickly and makes a big difference when you have a stuffy nose. Next up, I found a travel size sample from Previse and this is their Marine Skin Brightening Botanical Scrub. It has an interesting consistency as it feels more like a lightweight mousse than a traditional exfoliator, and features fossilized Marine Algae to gently exfoliate and polish the skin, without causing micro-tears that are commonly associated with other manual scrub ingredients. It's very gentle and I like it so far! Lastly, the product that I'm most excited about is from LA-based skincare brand called Gaffer & Child. This cleanser feels so light and would be perfect for anyone who has oily or combination skin. It's 100% raw, vegan and organic, and has an SLS-free base of Sunflower Oil, Castor Oil, Coconut Oil, Olive Oil and Jojoba Oil, which break down dirt and remove impurities, whilst the likes of Lavender, Peppermint, Green Tea and Willow Bark offer a deep clean, without stripping the skin of its natural oils. A little goes a long way too and it feels so wonderfully refreshing first thing in the morning, though I imagine I'll be using it more when Spring comes around. I've really enjoyed receiving the Goodbeing boxes and have discovered so many amazing natural beauty and lifestyle brands in a short space of time! Sadly, due to UK customs charges, this one will be my last box, but if you're reading this from America or don't mind paying them, Goodbeing are a fantastic subscription box to sign up to! What's your favourite natural beauty box? That's a great introduction, thank you. I got interested in subscription. However, you mentioned there were UK customs charges. As far as I know you only need to pay if the cost of parcel is higher than 15 GBP. This one costs 9.95 USD, so how come you incurred charges? Thank you! Oh dear! That's not fair (( Thanks again for clarification!